I had a call from the Grammar Lady yesterday. She was in a bit of a panic about a spelling error on Andy Bencosme's City Council candidacy webpage. I have received these kinds of calls from her in the past, usually right around election time. Normally I like to tell the Grammar Lady that we are all human, everyone makes mistakes once in a while, and isn't that why God put erasers on pencils? Besides, I am hardly perfect in this regard myself, so why would I want to throw those kinds of rocks around my glass house? However, she countered my misgivings with a rather emphatic argument. Andy has made his membership in MENSA an important part of his election presentation, and therefore he should NEVER make spelling errors. Especially in his official campaign material. "There are certain standards involved," she let me know. I said I would look into it. In a world that often rewards achievement more than it does those who do well on tests, I am not certain there is any real value in this. 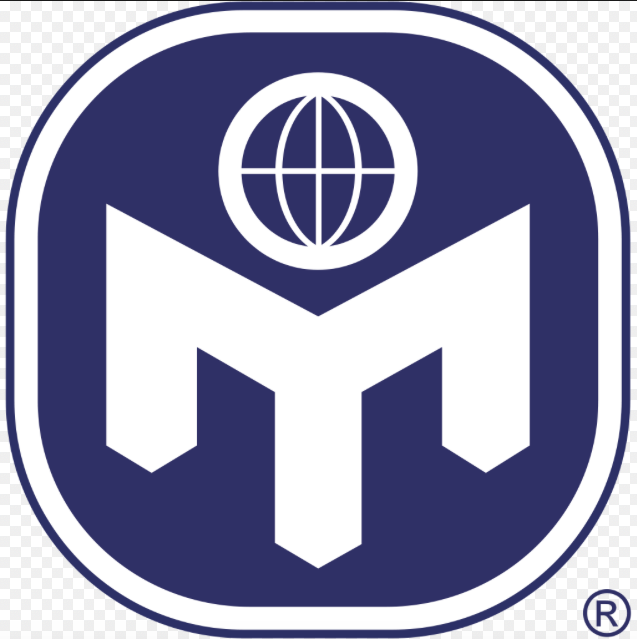 But if you would like to be able to tell people how smart you are, and need the backing of an official organization to make that claim believable, you can go to the MENSA website and take a test. This won't immediately qualify you for any "I am really smart" lapel pins, but it will let you know if you stand a chance of ever becoming quite that annoying. Good luck, and please, no cribbing. Andy has made his resume' available on-line (link), and here is the part where he discusses his MENSA membership. You might want to click on this to enlarge, especially if you are as blind as I am. I just hope living in Monrovia isn't a qualification for MENSA membership. Should that be the case very few people reading this blog are going to qualify. 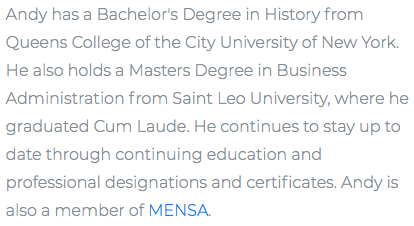 Andy also points out that MENSA credential on his campaign website. 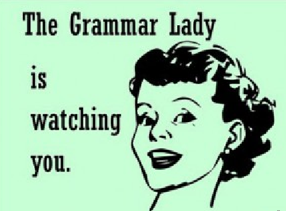 Anyway, back to the Grammar Lady's points of informed concern. If you go to the Andy 4 Sierra Madre webpage (link), you will be able to read about the many things Andy really likes about Andy. Here is a passage that gives you some spice on his hopes and dreams. It is called "Why Andy." I am sure Andy can say all of that, and more. I mean, who ever ran for City Council in Sierra Madre and didn't claim they could bring people together, make tough choices, and manage those tight budgets? And who doesn't love volunteers? People who are willing to work for no compensation other than the satisfaction of having done good deeds are always in high demand. What's not to like? However, the Grammar Lady was not especially happy about that "I know how to be creative or and make the tough choices when needed" passage. "That makes no sense," she grumbled. But where the ever vigilant Grammar Lady really got her straw and flowered hat into an unattractive shamble was over this ruby slipper. It is called "Issues." "That is not how you spell 'priveleged' you know," pointed out the Grammar Lady in a heated huff. "You'd think Mr. Smartypants would want to go to Staples and buy himself a MENSA spellcheck." I am not sure what I am supposed to do about this. I suppose I could turn Andy in to the MENSA Police and see if they'll revoke his membership. That is, if I remember their phone number. Or I could just post something here on The Tattler, and forget about it. Wouldn't be the first time I've done that. Vote for the 3 incumbents and preserve Sierra Madre. Most of the Mensa people I have met should have kept that info to themselves. As far as that being a qualification for office, let me divert to a little Valley Girl vocabulary...Fantastic NOT! wanna-be politicians can't help but always promote themselves. Think current POTUS as the worst case ever. Andy is just a smaller version of that. Trump and Andy are both stable geniuses. Yeah they are, and they prove it every day. I think somebody's head just blew up. Mensa - Interestingly, the Spanish use of the word mensa (female) or menso (male)generally denotes someone who is crazy or stupid. "No seas menso".... Don't be crazy. Or, "mensa, yo te dije que no lo hicieras"... stupid, I told you not to do it. 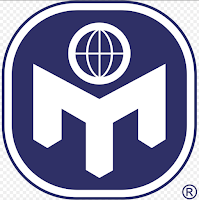 mensa ... A global scam which administers a test (charging in the range of 18$ to 30$) to see if you "qualify". It then proceeds to charge you a 52$ a year subscription charge. Multiply that times 50,000 members in America alone, I think you get the idea. Whatever you do, don't let mensa trick you into taking their test. "In a world that often rewards achievement more than it does those who do well on tests...."
Our world rewards inherited wealth and the appropriation of the fruits of the labor of others far more than achievement. "My career and life objectives have grown as a result of my education and professional experience. Through these, I have found myself to possess two great strengths. The first is recognizing talent and developing that talent to achieve the goals of the organization. The second is a love of detail without being bogged down by it. This detail could be a financial budget or editing a publication, they both require careful attention without getting overwhelmed by the task. Because of these strengths I have achieved results in every position I have held. This resume should help to illuminate those positions and results." That attention to detail is missing from his campaign website. Of course it is! That gobbledygook-speak is the canned language that these type of people use. It is a boastfulness that reveals some very basic insecurities. Lets set a few things straight, first of all no matter how smart on a sliding scale does not mean you have the intelligence to make any decisions correctly beside the American Penal system has plenty of High IQ prisoners? So using the MENSA card gains you nothing besides we have a screwed up president who things he is God's Gift tot he world and we all know he is crazy as a 'bed bug' and should be committed ASAP. Sure there are some high IQ sociopaths behind bars, but the vast majority are either average intelligence drug addicts or moronic thugs. Remember when Noah Green misspelled ‘campaign’ on his campaign posters? He got some of the numbers wrong, too. That's what happens when you have Nancy Walsh and Treasure Henderson running your campaign affairs. Andy B. and J. Capoccia are the same. Whatever a politician like Andy says, assume the opposite is true. Seems to me that the "legacy" that has been developed in recent years (more taxes, less foresight, questionable transparency) is NOT something we would want to preserve. Bringing in the Arcadia Association of Realtors to run Sierra Madre would only bring us back to the bad old days of Nancy Walsh, Josh Moran and John Buchanan. Maybe the Mod should post those Nancy Walsh tirade videos to remind people of just how bad things were under the Development Party. New political wisdom: better the flip flopper you know than the realtor pretending to be a businesssman that you know. He sure hides that fact. Any wager on the turnouts for the Sierra Madre election? The UUT ballot measure would be the only reason to take time out of a busy life and cast a vote. No one attends council meetings, doesn't really matter who sits on council they all do what they want anyway. Comic relief:E-mail takes such an effort! I'm voting YES on the UUT.. I like the three current council members. Their decisions are not based on financial gain. Also they are not backed by the Arcadia Board of Realtors. The ABR has no business meddling in Sierra Madre issues or elections. #Me Too. Unless you work for Hillary Clinton!!! Growing questions about how Hillary handles women accusers. She promotes the men and demotes the women accusers. Ancient history. Boring and meaningless. Not meaningless. It's an intentional tactic to distract from real problems. The Trumpies are flopping around like beached cod. A big wave called the FBI will soon wash away all of their nonsense. Former Fox host: Roger Ailes used surveillance equipment to secretly watch female hosts get undressed. I thought they just grab them by the ... jeez how lowthsome (misspelling intentional) they are. Seems like by caring more about image than the controls, Reagan put the GOP into a 30-something year flat spin that still hasn't quite hit the ground. Exactly! Not meaningless 11:16am. The Democratic Party has always touted they are the party that supports all women. That is unless you are Hillary! The voters got it correct when they elected President Trump. The Clinton's would have sent this Country back to the Stone Age. The Literacy Board. Get your hands up, you're under arrest. Somebody get 3:09 a cup of strong coffee. We need to sober him up before his Uber arrives. According to his resume' Arcadia Andy is a Republican. His resume also says he lives in Monrovia. That's pretty much all you need to know to vote against someone running for Sierra Madre City Council. Andy will get a ton of money from the Arcadia Assoc. of Realtors. Expect postcards. You can tell how much money they are giving him by the number of postcards he sends out. One mailing is about $4000. Printing, postage. Expect him to communicate his great love for Sierra Monrovia. State of the Union:The bringing back of America. Thank you President Trump. MAGA. Boring. Donny One Note just drones on and on. Even Republican Congressmonkeys are falling asleep. "The bringing back of America" says it all. Their inability to mimic American English will always differentiate them from us. Thanks for stopping by Comrade. Andy was on the committee at AAR that hired Chip. Need I say more. Chip Ahlswede. The wordy dude that was hired to defeat Measure V and failed miserably? Why am I not surprised? I think Andee / Andie / Andy has already set his la$er focus on the library and is ready to develop that parcel. Go MENSA! And St. Leo University - not exactly top tier.